Categorized as: Stories on January 25, 2014. Healthy workers not only feel happier, they work more productively to earn higher incomes for their families. 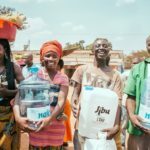 Freedom from Hunger, an integrated-services microfinance provider, has led the way in connecting their clients to affordable healthcare. We check out a clinic in Juliaca with Irene, Sabina, and Mery to see how the plan works in real life. Part 3 in our 5-part series from Peru. Cover photograph: Mery’s really smiling as she gets her blood drawn: Until her credit group, ADRA, created an affordable health plan with a private clinic in her town, she never had the time or money for routine well-care and diagnostic appointments. Photograph by Jim Cline for Freedom from Hunger. Juliaca, Peru: We believe that a global hunger relief and poverty alleviation organization can succeed only as far as our networks can reach; that’s why Freedom from Hunger finds in-country partners to deliver financial, education, and healthcare services our clients’ needs in each unique town or village. 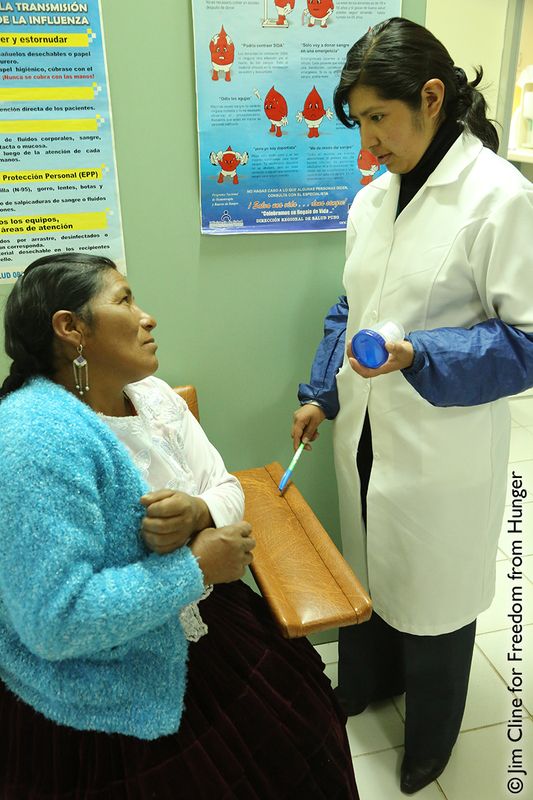 Here in Juliaca, our local provider ADRA agreed to implement our fast-growing Microfinance and Health Protection (MAHP) plan by contracting with a local medical clinic. Clinica Americana has all but emergency services available for Freedom from Hunger clients, who pay $4/month and then choose among a range of discounted care packages and medications. 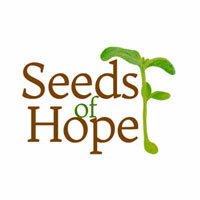 So far, 469 ADRA clients have signed up; the goal is 800. Today, we visit the clinic to observe how clients utilize this new system and get their feedback on what they need to thrive. 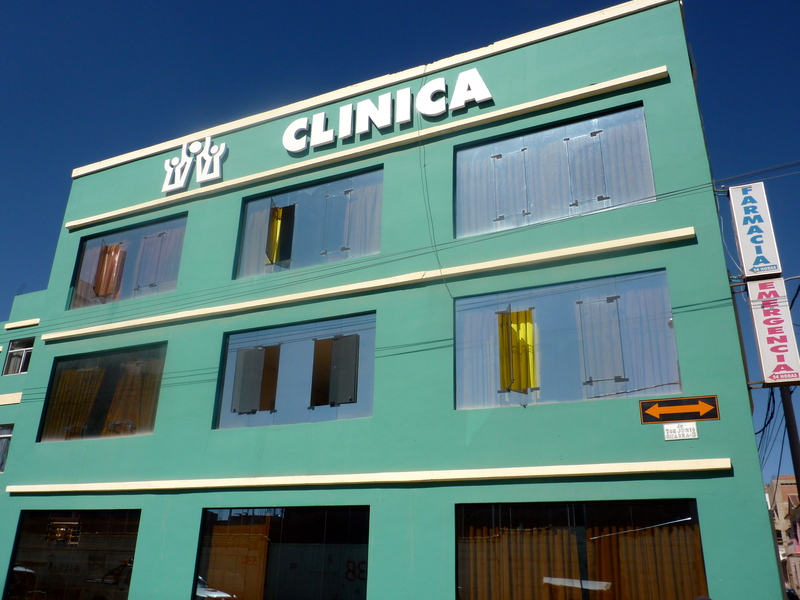 The clinic that serves our clients in Juliaca, Peru serves 120 patients per day for routine medical care. High up in the Andes Mountains, toward the southeastern border Peru shares with Bolivia and near the famously high-elevation Lake Titicaca, Juliaca is the largest city in the region with 225,146 inhabitants and lively commerce. Like our Chicago, it’s known as the “windy city” with chilling winds rolling through the plazas morning and night, graced by gentle sun in the afternoons. It’s a good place for microentrepreneurs to create warm clothing, foodstuffs, and building materials. However, until last summer, like so many places in the world and even in the U.S., it was not a good place to get sick—if you were poor. “This new plan is good, because it helps those of us who don’t have enough money,” says Irene Corceusto Aleman, a 43-year-old gold miner who took a three-hour bus ride down from the mountains where she works with chemicals and grinding machines all day in search of treasured golden nuggets. Irene belongs to a local credit group called “Santa Inez,” which has 21 members. Three of them have taken the morning off work to come together to the clinic for the first time: Irene, her friend 52-year-old Sabina Yanqui Arela, and her 26-year-old daughter Mery Pino Yanqui. How it works: Credit group members can opt to pay $4/month for a membership card. They choose a healthcare plan that works for them and request tests as needed. They’ve been with ADRA for nine years, but this is the first time they’ve had access to prorated healthcare. 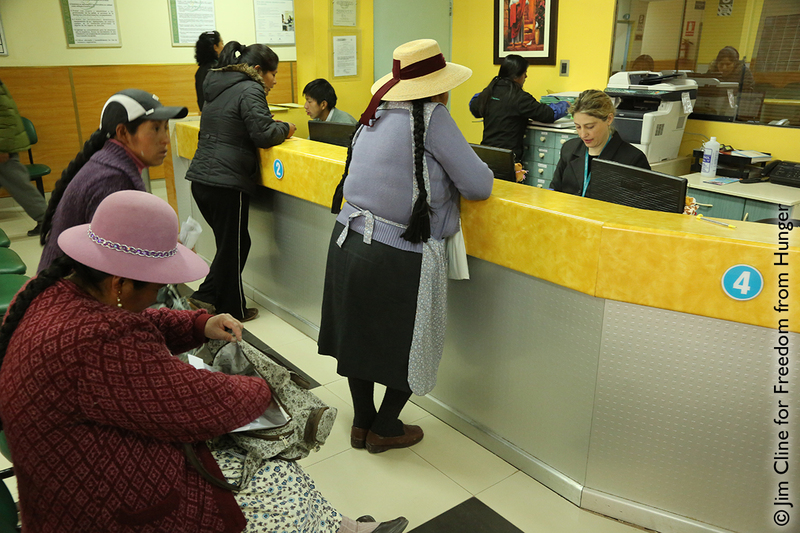 As the women walk in, they receive smiles in the busy clinic that serves 120 patients per day. Dozens of patients sit waiting on benches, but our clients get waved right to the front by receptionist Samuel Laura Cruz, whose singular job is to take care of ADRA clients. Irene studies a painting on the wall behind Samuel’s head: It show two doctors doing surgery on a patient while a glowing Jesus looks on with love. Samuel quickly gets the three women checked in. Irene wants an overall blood panel, “because I know we’re always eating high-fat foods.” Sabina is checking her cholesterol and follow-up care for a “serious brain illness” she had three years ago that sounds like it went untreated; she still has a “strong” headache she wants the doctor to check. And young Mery wants a scan for possible ovarian cyst or cancer, as she’s had quite a bit of recent pain in her abdomen. Our clients go right to the front of the line at the clinic, because of their special status with their microfinance partner. 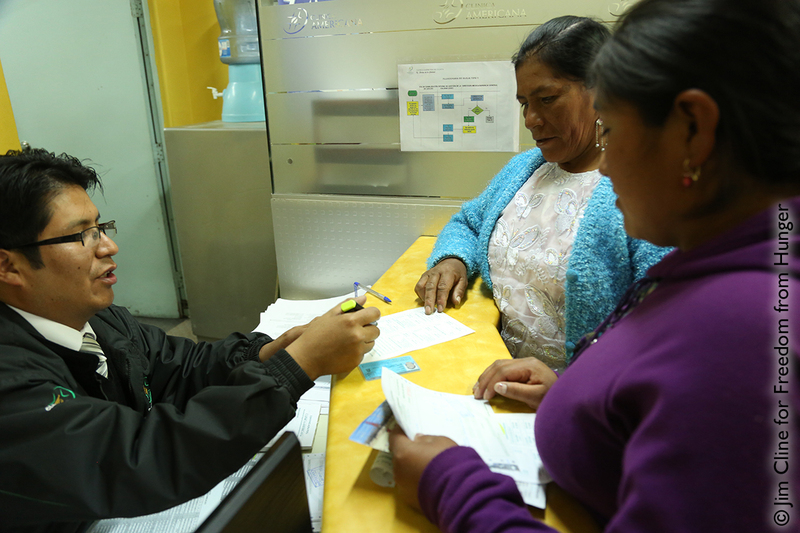 Samuel checks the healthcare ID cards and does an intake interview with Sabina (L) and her daughter Mery (R). Once registered, the women return to sit in the front lobby. A television overhead runs PSAs on hygiene and healthy practices; and a masked janitor quietly mops the floor around us. “The price here is really low,” Mery comments. “We used to have to go to the public health clinic. That’s where I had my baby.” Mery studied two years to become a nurse, but, she says, “I had to leave because I became pregnant.” Living with her partner and her now five-year-old son, Mery plans to return to nursing school when her boy begins school. So for now, like her mom Sabina, she runs a food business in the market selling vegetables. “I’m close to my mom’s shop, but I’m independent,” she remarks. Her mom talks about how she’s grown her business in the ten years she’s been with ADRA. “At the beginning, I used to just sell juice: Now I sell everything: vegetables, potatoes, rice, sodas, gas for kitchen stoves, ice cream, and milk.” It was working with ADRA that did it. I just worked hard and saved my money.” Sabina feels adamant about investing back into her business, not just with credit loans but with her own savings. She makes between $50-100 profit each week. Sabina looks skeptical as she discusses the need for further testing with the lab technician. They emerge back outside, into the bright high-altitude sun of the Peruvian afternoon. “It’s a good life, because we are fine,” Irene concludes. “We are just wondering if we can have the same program for our husbands.” In fact, our partner ADRA is already working on that, according to regional manager Maura Corimayhua Condori. 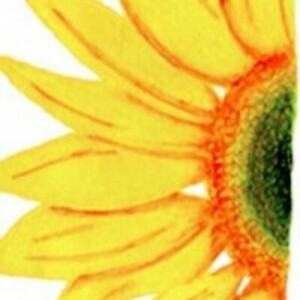 They soon will launch a healthcare protection plan that covers spouses, children, and parents.